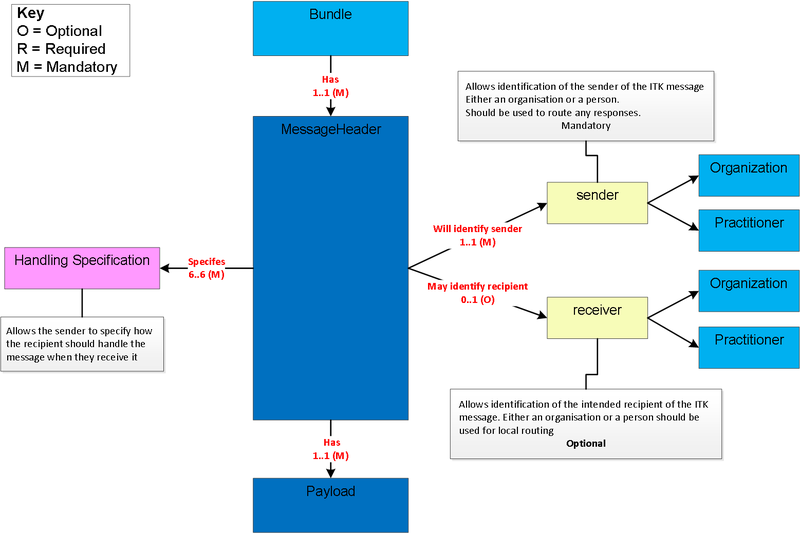 A brief introduction to getting started with the ITK3 Messaging Distribution. “ITK3 Messaging Distribution” is the term used for a set of generic FHIR messaging components. These messaging components have been developed by NHS Digital to allow a standard approach to FHIR MessageHeaders and responses (acknowledgements) across NHS message and document flows in England. The Payloads are not specified within this specification as these components can carry any Payload. These components, along with NHS Digital FHIR Message and FHIR Document specifications are part of the ITK3 solution. The ITK3 Messages are created using the formally defined HL7® approach and methodology for the creation and transmission of FHIR® documents and messages. For further information see FHIR messaging and FHIR Documents. FHIR Messaging components specified within this site have been developed by NHS Digital and use CareConnect Profiles created in collaboration with the INTEROPen community. The INTEROPen vision is to create a library of nationally defined HL7® FHIR® resources and interaction patterns that implementers can adopt to simplify integration and interoperability within England’s health and social care systems. Find out more on the INTEROPen website. This guide has been created to support the adoption of NHS Digital defined FHIR messages and documents. This site has been developed with input from stakeholders such as ITK3 Messaging Solution users, developers and architects. MUST: This word, or the terms “REQUIRED” or “SHALL”, means that the definition is an absolute requirement of the specification. MUST NOT: This phrase, or the phrase “SHALL NOT”, mean that the definition is an absolute prohibition of the specification. SHOULD: This word, or the adjective “RECOMMENDED”, means that there May exist valid reasons in particular circumstances to ignore a particular item, but the full implications Must be understood and carefully weighed before choosing a different course. SHOULD NOT: This phrase, or the phrase “NOT RECOMMENDED” mean that there May exist valid reasons in particular circumstances when the particular behaviour is acceptable or even useful, but the full implications should be understood and the case carefully weighed before implementing any behaviour described with this label.